When I found these pretty gold-plated filigree rounds, I knew that they were destined to become the delicate supports for a pearl necklace. I chose rose hued fresh water pearls, but you could substitute whatever color you wanted, or use completely different beads instead! 1. Slide a pearl and a 2 mm gold-plated round onto 18 head pins. 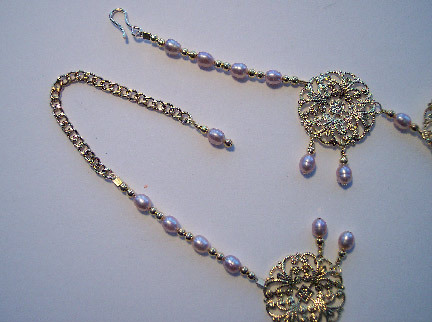 Create a wrapped loop with each so that there are 2 dangles hanging from the bottom of each of 9 filigree rounds. 2. Connect the filigree rounds together as follows: Turn a small wrapped loop around the upper side hole of one filigree round using a 3” piece of 24 gauge wire. Slide on a pearl between two gold rounds, and create another wrapped loop around the next filigree round. Continue connecting in this way until all 9 are linked. 3. Cut your piece of beading wire in half. 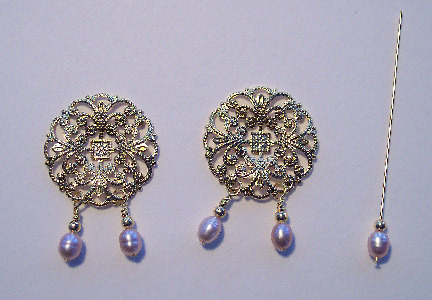 Crimp one piece to each outside filigree round. 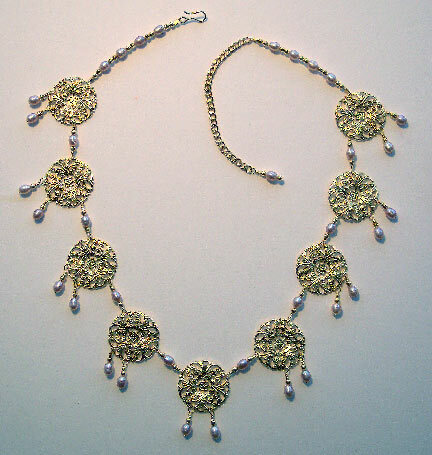 Add 3-4 inches of pearls and 2mm gold-plated rounds. I alternated 2 gold-plated rounds with each pearl. 4. On one end, crimp the wire around a hook, and work the end back through the last two gold-plated rounds. Clip the wire end off close. On the other end, crimp the wire around a length of chain to make the necklace adjustable. Make sure the chain links are big enough to accommodate the hook. 5. Create a dangle with the last head pin, sliding on a pearl between two gold-plated rounds. Wrap a loop around the free end of the chain. You can wear this necklace snug like a choker, or longer if it suits your clothing neckline. 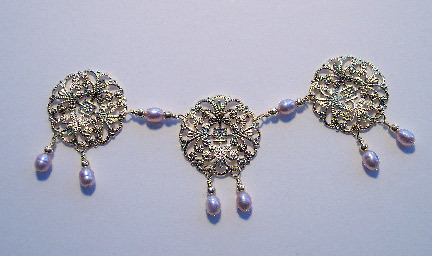 The filigree and pearl combination is just perfect. I love those filigree rounds.